Actions can access the original request and response, if required. access the HttpServetRequest or HttpServletResponse directly. 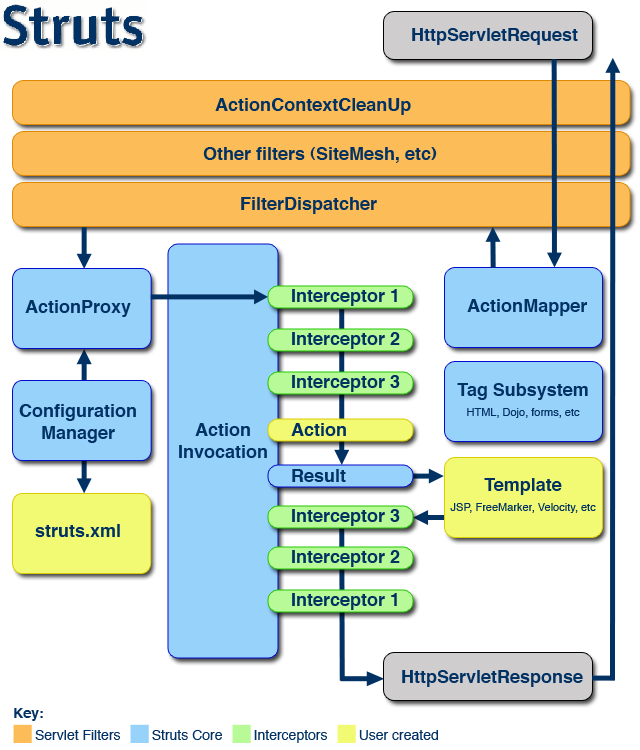 object with an execute signature can be used as an Struts 2.0 Action object. validation via a validate method. class type and the validation context. independent, hence testability is quite easy in struts2. objects, can be used as input/output objects. expression language called “Object Graph Notation Language” (OGNL). which may have the same property name but different property types. are per-class and not configurable per instance. However Struts 2.0 uses OGNL for type conversion. The framework includes converters for basic and common object types and primitives. module, but all the Actions in a module must share the same lifecycle. 이 글은 Apache Project/Struts 2.x 카테고리에 분류되었고 apache struts, apache struts2, struts, struts2 태그가 있으며 mcsong님에 의해 2008년 9월 26일 에 작성되었습니다. 이 글은 Apache Project/Struts 2.x 카테고리에 분류되었고 apache struts2, DTD, struts2 태그가 있으며 mcsong님에 의해 2008년 4월 28일 에 작성되었습니다.